He’ll be the first rapper to bring his own interpreter as opposed to having the venue provide one. Chance the Rapper doesn't want his deaf or hard-of-hearing fans to miss out on any of the fun at his concerts. 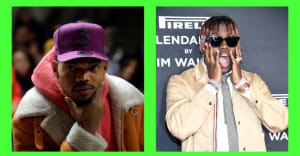 According a CBS affiliate in Tampa, Florida, Chance has hired interpreters from DEAFinitely Dope, an organization that aims to change "the way you experience hip-hop and R&B through sign language." In a video posted to Facebook, Chance was joined by interpreter and DEAFinitely Dope founder Matt Maxey to announce the inclusion of interpreters at his upcoming live shows. “If you know anyone that’s deaf or hard-of-hearing please invite them to the show. We just want to turn up." Chance will be performing at festivals throughout the summer, you can find dates here. Thumbnail image from Frazer Harrison/Getty Images.